One good thing that has come out of my attempt to do A-Z of Bengali Cuisine is to cook Bengali dishes which I might have forgotten about or which I might not have cooked otherwise. So, thinking of the next letter "D", it struck me that I have never posted a Dim er devil (Deemer Devil) recipe. Actually I have not even made a Dimer devil in the last 8 years. And before that maybe once. Bad track record, but then I have said many times, I do not deep fry much. The strangest thing is 4 years ago, I had made a Maacher Chop with Argentina playing Netherlands. 4 years later, I made Dim er Devil with Argentina playing Germany. Football stresses me to deep fry I guess. Dim er devil is not deviled eggs, though it owes its name to a similar root. It is a very popular snack for most Bengalis and my Mother used to make it very often. When she made it, I had no clue that there existed a deviled egg. I also had no clue how a strapless dress holds itself up. Well, we are deviating but I did have that doubt. And still am not sure. Honest. Now according to western recipe sources, deviled eggs are hard boiled eggs, shelled and cut in half, and then filled with the cooked egg yolk which had been taken out and mixed with mayo, seasonings etc. They are served cold and as you can understand pretty simple to make.Roots of this deviled eggs can be traced back to ancient Rome. What I did not know was, the first known printed mention of ‘devil’ as a culinary term appeared in Great Britain in 1786, in reference to dishes including hot ingredients or those that were highly seasoned and broiled or fried. By 1800, deviling became a verb to describe the process of making food spicy. According to the dictionary, the cooking term devil means 'to chop food finely and mix with hot seasoning or sauce, usually after cooking'. This gives us an idea of how the current day Bengali Dim er Devil got its name. It was based on the original recipe of the devilled egg introduced by the British rulers of Kolkata in the era of the Raj. The Raj kitchens were manned by Khansamas, who were from central and eastern India, Goa, Madras, Nepal and the Mog community of Bangladesh. Before working for the Raj, they worked in the kitchens of the princely states of India where they started off as kitchen boys helping the chief cook. With their culinary instinct and innovation they grew into such exceptional chefs that their talent is now legendary. With the end of the princely states, life became hard in the royal kitchens and the khansamas found jobs in clubs, army mess and British Raj households. The British memsahibs taught them European cuisines and introduced them to western techniques and ingredients. The khansama made puddings in tandoors, soufflês in steamers and roast duck in dekchis. They are responsible for much of the amalgamation of British cuisine with Indian methods and thus introducing chicken jal frezi, caramel pudding and chicken cutlets to the Indian society. You can now well imagine that when it came to deviled eggs, they were not merely satisfied by stuffing the egg with a spicy filling but went a step ahead to coat and fry it like a chop or croquette and thus giving birth to "Deem er Devil". Edited to Add: After a few comments from readers on Facebook and here, I found that British Scotch Eggs are closer to our "Deem er Devil". Apparently the British department store Fortnum & Mason claims to have invented it in 1793. 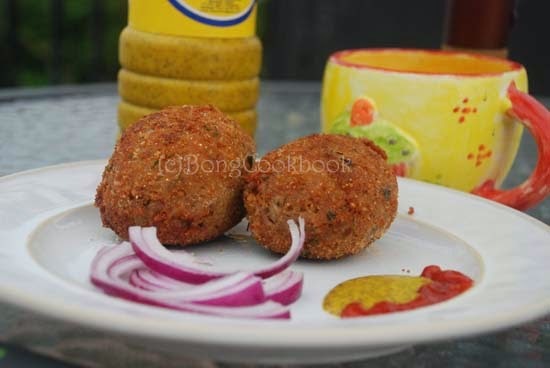 But again, they seem to have imitated the Moghul recipe of "Nargisi Kofta", where hard boiled eggs are encased in a covering of spicy keema and fried after which they are put in a special gravy. These Koftas when served, were cut in half and the yellow center surrounded by the white resembled narcissus flowers blooming in spring(Source of name). That is apparently how they got their name. After all this research, it then looks like that "Deem er Devil" was the brainwave of a Bengali Khansama who was inspired by both these recipes. 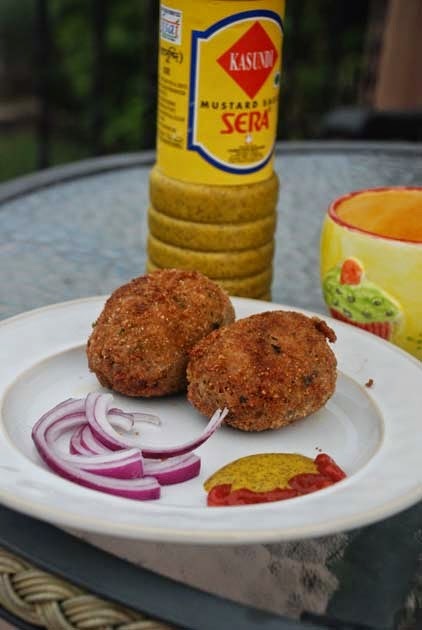 Of course it became immensely popular and once the Brits left India, Kolkata forgot the original deviled eggs and reveled in this deep fried delicacy. From Bengali homes to street side stalls, dim er chop or dimer devil, spread like wild fire. There are two or three different ways to make this snack. In one version, the covering is made only with spicy mashed potatoes; in the second version, the cooked egg yolk is taken out, mixed with the potato mixture, seasoned and then stuffed back after which the egg is covered in a potato coating; in a third version, the covering is made with cooked and spiced mixture of ground meat and potato. 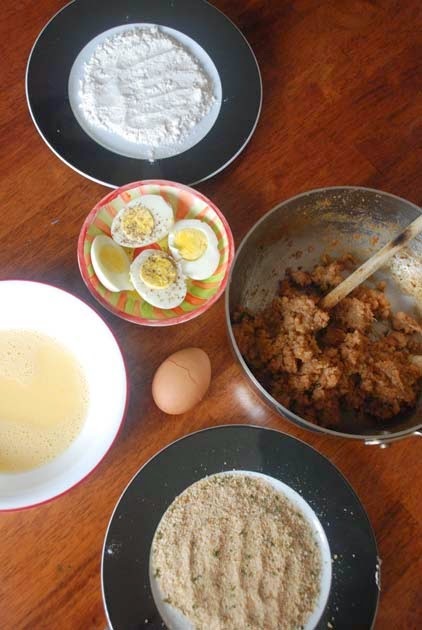 I have followed the third version here and I have used ground chicken and potato to make the covering. First we will boil eggs. Put 2 eggs to boil in a saucepan. Once the eggs are boiled and cooled, peel them. Then Cut them halves. So now we have 4 egg halves. Sprinkle the halves with some ground pepper. Put 1 large or 2 medium potatoes to boil.I usually chop them in four and set them to boil in a covered saucepan filled with water. Takes about 25-30 mins. You can also cook the potato in pressure cooker. Stir around for a few mins. When it starts to lose its raw pink coloring, add the mashed potatoes. Stir and pat and mix again, letting the ground meat cook fully. The keema+potato mixture will take on a brownish tinge by now. At this point, taste and adjust for any seasoning. Sometimes I add crushed fried onions(from the box) to the keema potato mix. Once it has cooled down,mix the ground meat and potatoes once more with your fingers. The mix should be on the drier side and not too soft to hold shape. If you think it is too soft to mold add some corn starch. Take a ball of the keema+potato mixture on your palm and then flatten it out. The surface should be big enough to hold the egg half. Roll the chop/croquette in flour --> Dip in egg wash --> roll in bread crumbs. Note: I have noticed that after the chop/croquettes have been rolled in brad crumbs if you let them rest in the refrigerator for half hour , the coating is better. 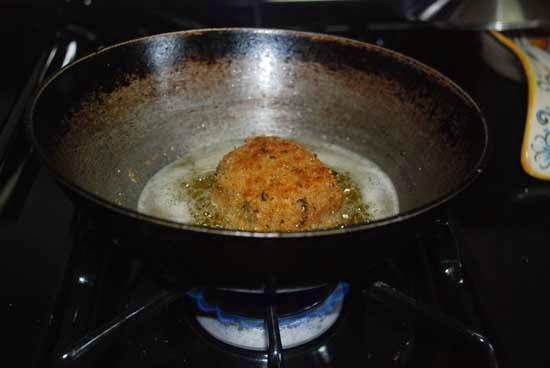 Now heat enough oil for deep frying. To see if the oil is ready drop a small speck of the keema dough in oil. If it bubbles and rises, oil is ready. Bite in and enjoy the magic when two cuisines meet and only get better. Pictures look great, I'm sure the taste was just what I remember them to be! Loved to learn the bit of history on the names/terms, the dish itself, and the cooks & culture of the times! Thank you! 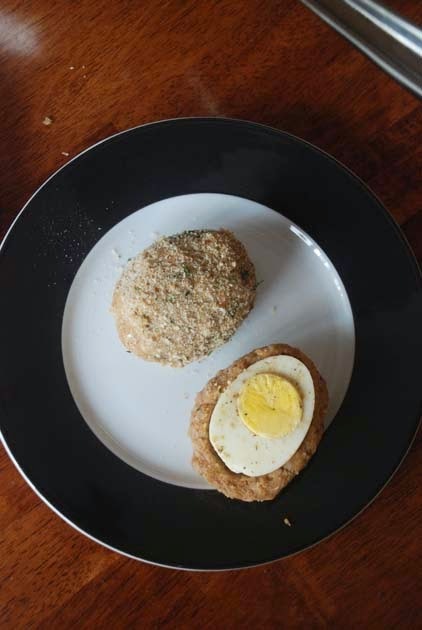 This sounds wonderful -- it reminds me more of scotch eggs than deviled eggs, but I'm sure that I will forget all the appropriate terminology once I dip a coated, deep fried egg in Kashundi! Ekhane ekta farm aachhe, with a lovely bistro, where we often go often just for the scotch eggs. I've often wanted to ask them what their secret crumb-cover is made of. It's amazingly crunchy. Definitely not just breadcrumbs. Oats mixed I think. Love Deemer Devil. I use the air fryer a lot for this. BTW, that salad that accompanies the Deemer Devil when you buy them in movie halls - have you been able to replicate that? Yes, I thought of Narigisi Kofta when I saw your post. Have eaten it only a few times. hey love the post ! and great articles and congrates on reaching the top sites,.............i will be back visit to often. Loving all the flavours and spices going on in this dish definitely looks delicious and something I would LOVE to eat. Darun recipe.thik jamon ta chai.complete and handy. This is a good style, Bong Mom! I love Bengali Cuisine and also your deviled eggs Bengali style. This is a very delicious and easy recipe. Thank you for sharing this awesome Bengali recipe. 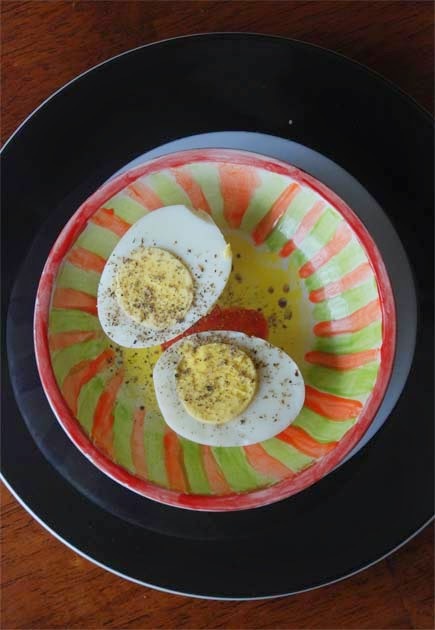 I love Bengali Cuisine and also your deviled eggs Bengali style. Thanks ones again. Those look fantastic. They look like these Irish eggs I had a pub once, but your seasoning blend looks to take the eggs to a whole different level. I can't wait to give these a try.